Unattributed Maker Durham Ox Series China - 2 items found. 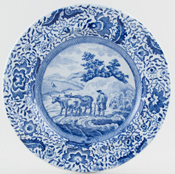 This series comprises some 9 different rustic scenes, incorporating cattle and on this plate is the Durham Ox himself. Bred by Charles Colling of Ketton Hall, Brafferton near Darlington, Co Durham the Ox was born in 1796 and was famed for its massive size and after it was sold to John Day of Harmston near Lincoln in 1801 it was transported round England in a specially built carriage pulled by 4 horses and displayed at agricultural shows and the like, with Day charging admission to see the beast. Charles Colling and his brother Robert of nearby Barmpton developed the shorthorn breed of cattle using the selective breeding techiniques pioneered by Robert Bakewell. The Ox was an early example of that breed, but after dislocating its hip in 1807 it was slaughtered. It was painted by John Boultbee in 1802 with John Day at its head and this picture was engraved and over 2000 of the engravings were sold. This became the source print for the main Durham Ox view, although the other source prints have not been identified. No backstamp as is usual with this series. 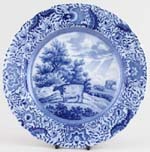 This plate is in superb condition, with only a few utensil marks and a few minor signs of wear on the rim. The glaze is sound and bright and overall almost as new.